"Selling radios at the Radio Attic since August 2000"
To see more of this seller's radios, visit James Hauskins' Attic. SALE! 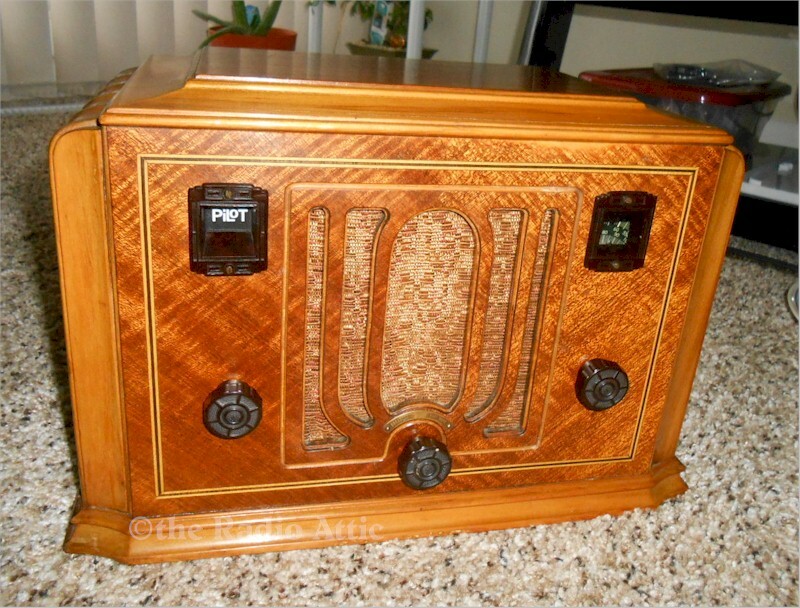 Stunning Pilot radio (model B2 cabinet variation), Obviously restored (probably recent but no history on it). Double front lamps give nice glow to dial and front speaker cloth. TRF set with restoration of chassis as shown. All Tubes checked and controls cleaned and lubed. Set plays very well with antenna (10-ft) used and picked up many AM stations as well as shortwave ones. Doesn't have the higher volume but sufficient for normal listing levels. Many more pictures available upon request. The photos should indicate the level of restoration. Fairly heavy for its size (12"W x 7"H x 9"D) as these sets were. Would guess it to early 1930s. Shipping additional. Was $595.00, now $476.00. You are visitor number 330 to this page.